For the military use of the facility, see Don Muang Royal Thai Air Force Base. Don Mueang International Airport (Thai: ท่าอากาศยานดอนเมือง, pronounced [tʰâː.ʔāː.kàːt̚.sā.jāːn.dɔ̄ːn.mɯ̄a̯ŋ], or colloquially as สนามบินดอนเมือง, pronounced [sā.nǎːm.bīn.dɔ̄ːn.mɯ̄a̯ŋ]) (IATA: DMK, ICAO: VTBD) (aka Bangkok International Airport) is one of two international airports serving Greater Bangkok, the other one being Suvarnabhumi Airport (BKK). The airport is considered to be one of the world's oldest international airports and Asia's oldest operating airport. 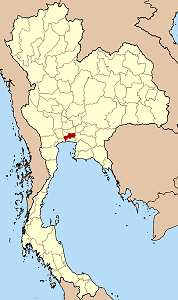 It was officially opened as a Royal Thai Air Force base on 27 March 1914, although it had been in use earlier. Commercial flights began in 1924, making it one of the world's oldest commercial airports. The first commercial flight was an arrival by KLM Royal Dutch Airlines. In September 2006, Don Mueang Airport was closed and replaced by the newly opened Suvarnabhumi Airport, before reopening on 24 March 2007 after renovations. Since the opening of the new airport, it has become a regional commuter flight hub and the de facto low-cost airline hub. In 2015, it became the world's largest low cost carrier airport. Don Mueang previously carried the BKK IATA code (subsequently transferred to Suvarnabhumi) and was an important hub of Asia and the hub of Thai Airways International prior to its closure. At its peak, it served most[clarification needed] air traffic for the entire country, with 80 airlines operating 160,000 flights and handling over 38 million passengers and 700,000 tons of cargo in 2004. It was then the 14th busiest airport in the world and 2nd in Asia by passenger volume. Currently, Don Mueang is the main hub for Nok Air, Thai AirAsia, Thai Lion Air, and New Gen Airways. "Don Mueang" airfield was the second established in Thailand, after Sa Pathum airfield, which is now Sa Pathum horse racing course, known as the Royal Bangkok Sports Club. The first flights to Don Mueang were made on 8 March 1914 and involved the transfer of aircraft of the Royal Thai Air Force. Three years earlier, Thailand had sent three army officers to France to train as pilots. On completion of their training in 1911, the pilots were authorized to purchase eight aircraft, four Breguets and four Nieuports, which formed the basis of the Royal Thai Air Force. Sa Pathum airfield was established in February 1911 with an arrival by Orville Wright, seven years after the invention of the first airplane by the Wright brothers on 17 December 1903. In 1933, the airfield was the scene of heavy fighting between royalists and government forces during the Boworadet Rebellion. The airfield was used by the occupying Japanese during World War II, and was bombed and strafed by Allied aircraft on several occasions. After the war had finished in September 1945 the airfield was occupied by the RAF during the brief British occupation of Thailand until March 1946 when 211 Squadron, which moved there in October 1945, was disbanded. During the Vietnam War, Don Mueang was a major command and logistics hub of the United States Air Force. Before the opening of Suvarnabhumi, the airport used the IATA airport code BKK and the name was spelled "Don Muang". After Suvarnabhumi opened for commercial flights, the spelling was changed and as "Don Mueang" it now uses the airport code DMK, though it still retains the ICAO airport code VTBD. The traditional spelling is still used by many airlines and by most Thais. International departure: Although scheduled for Kuwait Airways KU414 to Kuwait at 02:50, Qantas flight QF302 to Sydney, originally scheduled for 18:00, was delayed for more than nine hours before finally taking off at 03:12, about ten minutes after the Kuwait flight. Qantas claimed that QF302 was an extra flight. Commercial carriers deserted Don Mueang at the opening of Suvarnabhumi Airport. But the higher operating costs of the new airport and safety concerns over cracked runways at the new airport caused many to seek a return to Don Mueang. Low-cost airlines led demands for a reopening of the airport. Airports of Thailand released a report at the end of 2006 which furthered this effort. The report proposed reopening DMK as a way to avoid or delay second-stage expansion which had been planned for Suvarnabhumi. On 30 January 2007, the Ministry of Transport recommended temporarily reopening Don Mueang while touch up work proceeded on some taxiways at Suvarnabhumi. The recommendation was subject to approval by the Thai cabinet. On 25 March 2007, the airport officially reopened for some domestic flights. Because of the 2011 Thailand floods that affected Bangkok and other parts of Thailand, the airport was closed as flood waters flowed onto the runways and affected the lighting. Don Mueang reopened on 6 March 2012. On 16 March 2012, the Government of Thailand and Prime Minister Yingluck Shinawatra ordered all low-cost, chartered, and non-connecting flights to relocate to Don Mueang. This ended the single-airport policy. Airports of Thailand was ordered to encourage low-cost carriers to shift to Don Mueang to help ease congestion at Suvarnabhumi Airport. Suvarnabhumi airport was designed to handle 45 million passengers per year, but it processed 48 million in 2011 and number was expected to reach 53 million in 2012. Some ten airlines may relocate to Don Mueang. Budget airline Nok Air is already serving flights from and to Don Mueang. Nok Air handles about four million passengers per year. Orient Thai Airlines and Thai AirAsia have also started operations at Don Mueang. Thai AirAsia carried 7.2 million passengers in 2011. The number is projected to grow to eight million in 2012. Currently Terminal 1 is capable of handling 18.5 million passengers annually. On 7 September 2013, Airports of Thailand announced its three billion baht renovation to reopen Terminal 2 as early as May 2014. Terminal 1's passengers in 2013 will likely reach 16 million against its capacity of 18.5 million. Completion of Terminal 2 in December 2015 increases Don Mueang's passenger capacity to 30 million a year. The third phase of Don Mueang's 38 billion baht expansion will stretch from 2018 to 2024. It aims to increase the airport's passenger capacity to 40 million per year from its 38 million passengers in 2017. The new 155,000 m2 international Terminal 3 will accommodate 18 million passengers a year. Don Mueang International Airport has three terminals. Terminal 1 is used for international flights and Terminal 2 for domestic flights. The opening of Terminal 2 has raised the airport's capacity to 30 million passengers per year. Terminal 3 the old domestic terminal is not now used. A Thai Lion Air Boeing 737-900ER bound for Hat Yai. Total passenger traffic through Don Mueang jumped 40.7 percent to 30.3 million in 2015, with international numbers rising 53.1 percent to 9.17 million and domestic passengers increasing 35.9 percent to 21.1 million. Aircraft movements rose by 29.8 percent to 224,074, including 158,804 domestic (up 26.2 percent) and 65,270 international (up 39.3 percent). Don Mueang International Airport is a joint-use facility, shared with the Royal Thai Air Force's (RTAF) Don Muang Royal Thai Air Force Base, and is the home of the RTAF 1st Air Division, which consists primarily of non-combat aircraft. A RTAF golf course is located between the two runways. The course has no separation from the runway, and golfers are held back by a red light whenever planes land. On 25 December 1976 – EgyptAir Flight 864, a Boeing 707-300 bound for Bangkok from Cairo, crashed into an industrial area near the airport during a landing attempt. All 53 aboard were killed. On 27 April 1980 – Thai Airways Flight 231, a BAe 748 which was en route from Khon Kaen to Bangkok, lost altitude during a thunderstorm and crashed about 13 km from Bangkok International Airport. All four crew members and 40 of the 49 passengers were killed. On 1 April 1981- Indonesian Special Forces (Kopassus) raided hijacked Garuda Indonesia Flight 206 which was en route from Palembang to Polonia Airport (hijacked in Indonesian airspace). All 48 passengers safe, seven fatalities (one commando, one co-pilot, five terrorists). Imran bin Muhammad Zein, hijacker leader, captured. On 9 September 1988– Vietnam Airlines Flight 831 crashed while on approach to Don Mueang International Airport. 76 of the 90 passengers and crew on board were killed. On 26 May 1991 – Lauda Air Flight 004, which was headed to Wien-Schwechat International Airport in Vienna, suffered an in-flight deployment of the thrust reverser on the No. 1 engine after taking off from Don Mueang. There were no survivors from the 213 passengers and 10 crew. On 21 January 1992 – Douglas VC-47D L2-41/15/210 of the Royal Thai Air Force was damaged beyond repair in a landing accident. On 23 September 1999 – Qantas Flight 1, in what was then the most serious incident in the airline's famously safe jet aircraft history, a Boeing 747-400 overshot the runway causing significant damage but no casualties. On 3 March 2001 – Thai Airways International Flight 114, a Thai Airways International Boeing 737-400 (HS-TDC), bound for Chiang Mai from Bangkok, was destroyed by an explosion and fire that occurred about 35 minutes before Thaksin Shinawatra, later to become Prime Minister of Thailand, and about 150 other passengers were to board. Five members of the cabin crew were aboard, and one was killed. Witnesses said they heard an explosion before flames erupted aboard the aircraft. Subsequently, NTSB investigators reported that the central fuel tank had exploded followed by the right tank 18 minutes later. The cause for the explosion was unclear, though some speculate it was an assassination attempt based on chemicals found during the subsequent investigation. 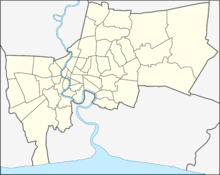 Don Mueang International Airport is approximately 1–1.5 hours from Suvarnabhumi Airport by rail or bus. There are also direct buses between the airports operated by Airport Shuttle Bus. The airport has two main access routes. Among these the most convenient route is via the Don Mueang Tollway. Another main airport entrance is Vibhavadi Rangsit Road. Four bus routes service the airport. The bus #A1 runs between the airport and the nearest BTS Station, Mochit Station. #A2 runs between the airport and Victroy Monument. #A3 runs between the airport and Lumphini Park. #A4 runs between the airport and Sanam Luang. Don Mueang International Airport is served by the SRT Dark Red Line and Airport Rail Link at Don Mueang Station that connected with Bang Sue Central Station, it will open in 2020. ^ "Air transport statistic 2016 summary" (PDF). Airports of Thailand PLC. 23 January 2017. ^ "Midnight Initiation for Suvarnabhumi". Archived from the original on 1 May 2015. Retrieved 4 June 2015. ^ "돈므앙 국제공항" (in Korean). Retrieved 28 March 2018. ^ "Bangkok Don Mueang becomes world's largest LCC airport, overtaking KLIA, Barcelona & Las Vegas". Centre for Aviation. Retrieved 13 September 2015. ^ "Exporters pan new export fees". Archived from the original on 3 March 2016. Retrieved 4 June 2015. ^ "ATW: LH Cargo set to be first into Suvarnabhumi". Archived from the original on 27 September 2007. Retrieved 2 October 2006. ^ "In With the Old", Aviation Week & Space Technology, 1 Jan 2007. ^ "Use Don Muang during repairs: 2 airlines". www.pressreader.com. The Nation. 27 January 2007. Retrieved 14 May 2017. ^ Don Muang Airport (DMK) Bangkok Thailand | Don Muang Airport Guide. Donmuangairportonline.com. Retrieved on 25 Aug 2013. ^ "Thai floods: Bangkok Don Muang airport suspends flights". BBC News. Retrieved 4 June 2015. ^ "Low-cost carriers start launching from Don Mueang". The Nation. Bangkok. 1 October 2012. Retrieved 15 October 2012. ^ a b Thongrung, Watcharapong; Amnartchareonrit, Bamrung (16 March 2012). "Budget airlines to fly from Don Mueang". The Nation. Bangkok. Retrieved 15 October 2012. ^ Mahitthirook, Amornrat; Kositchotethana, Boonsong (21 June 2012). "Airlines get big discounts for move to Don Mueang". Bangkok Post. Retrieved 10 November 2012. ^ Pinijparakarn, Sucheera (23 May 2012). "IPO of Asia Aviation is expected to raise Bt4.5 bn". The Nation. Bangkok. Retrieved 15 October 2012. ^ Amnartchareonrit, Bamrung (18 August 2012). "Don Mueang will be ready on time, AOT says". The Nation. Bangkok. Retrieved 15 October 2012. ^ "Don Mueang's T2 set for B3bn makeover | Bangkok Post: business". Bangkok Post. Retrieved 15 January 2018. ^ a b "Airports upgrades gain altitude". The Nation. 27 July 2018. Retrieved 4 January 2019. ^ Intharagsa, Rachanon (24 December 2015). "Busy traffic at Don Mueang's Terminal 2". The Nation. Retrieved 24 December 2015. ^ "Flight Information (International Charter Flights)". hij.airport.jp/english. Retrieved 5 July 2018. ^ "Nok Air adds Phetchabun from June 2018". routesonline. Retrieved 7 June 2018. ^ "Nok Air files India scheduled service from April 2019". routesonline. Retrieved 25 March 2019. ^ Flightradar24 (2 July 2018). "Nok Air flight DD3118". Flightradar24. Retrieved 8 July 2018. ^ "NokScoot adds Shanghai service from Feb 2019". routesonline. Retrieved 28 January 2019. ^ "AirAsia set to soar with new routes, new planes and a sharper customer focus". AirlineRatings. Retrieved 7 February 2019. ^ "Thai Airasia Carrier Expands Japan Network With Bangkok-Nagoya Service". Nationmultimedia.com. Retrieved 10 October 2018. ^ a b c "Thai Lion Air schedules additional routes to Japan in 1Q19". routesonline. Retrieved 27 January 2018. ^ "New Destination: Bangkok to Tokyo (Narita), Japan". Lionairthai.com. Retrieved 2 November 2018. ^ "Thai Lion Air adds Xuzhou charters from July 2018". Routesonline. Retrieved 8 July 2018. ^ Kositchotethana, Boonsong (1 February 2016). "AoT airports set new record in passenger traffic". Bangkok Post. Retrieved 1 February 2016. ^ a b "Traffic Report 2016 - AOT (DMK Page 11)" (PDF). Airports of Thailand PCL. Archived from the original (PDF) on 21 September 2017. Retrieved 1 October 2017. ^ Home page. Siam Air. Retrieved on October 26, 2016. "CONTACT INFO Address : Siam Air Transport Co.,Ltd. 222 Room 2323 P Vibhavadi – Rangsit Road Donmueang International Airport, Donmueang, Bangkok, Thailand 10210"
^ "Headquarter." [sic] R Airlines. Retrieved on 27 January 2013. ^ "L2-41/15/210 Accident description". Aviation Safety Network. Retrieved 24 June 2010. Flight International, The airport is presently using the IATA airport code DMK, while Suvarnabhumi Airport has inherited its previous code BKK. Flyer Talk, 26 August 2006. Airport information for VTBD at World Aero Data. Data current as of October 2006. ^ "Jetstar and Thai Airways first to use new airport". Archive.is. Retrieved 10 October 2018. ^ Suvarnabhumi – latest news. Important. – Page 3 – FlyerTalk Forums. Flyertalk.com (20 July 2006). Retrieved on 25 August 2013.